A Portland, Ore., couple got special congratulations from J.K. Rowling for popping the question Harry Potter-style. 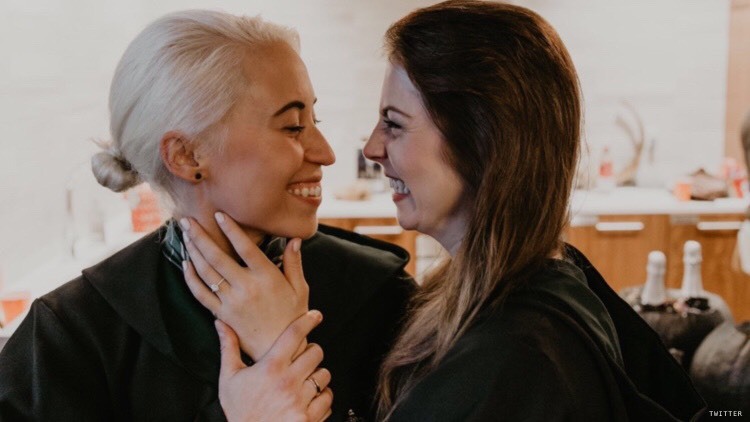 Heather Pearson, who identifies as a Slytherin and a die-hard Harry Potter fan, proposed to her girlfriend, Kelsey Stacy, in an elaborate wizard scavenger hunt that took her a year to plan. “Kelsey and I went to Harry Potter World on our first anniversary, we love Harry Potter, all the movies and all the books," Pearson said in a video describing the event, noting that the two already were equipped with their own wands and Slytherin cloaks. Pearson asked Stacy to help her plan a Hogwarts-themed party. "Little did she know, she was planning her own engagement party as well!” the bride-to-be revealed. Pearson invited Stacy on a city-wide scavenger hunt, where their friends popped up holding Harry Potter books with love letters from Draco Malfoy. Finally, when Stacy reached Harry Potter and the Goblet of Fire (the couple's favorite book in the series) Pearson emerged dressed up as Draco. The book was intricately folded so its pages read "Marry me?" Pearson pulled a ring from the binding and got a heartfelt yes. The moment was so moving that series author J.K. Rowling tweeted out the proposal, offering her congrats. Watch the elaborate proposal below.